Electron microscopy allows for studying bacterial ultrastructure at high resolutions. Two types of electron microscopes are used for this purpose. The transmission electron microscope allows for access to inner bacterial ultrastructure when imaging ultrathin sections as well as cell wall-attached structures by negative staining, whereas scanning electron microscopy allows for the detection of structures on the bacterial cell surface alone or to study the interplay between pneumococci and their host cells. 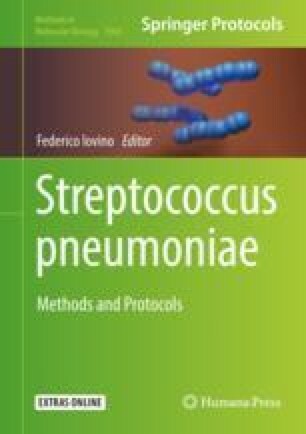 This chapter deals with recommendations for well-adapted methodologies to examine pneumococcal ultrastructure in detail. Especially, we focus on the preservation of the pneumococcal capsular polysaccharide, which represents an important virulence factor of pneumococci. Since capsules are highly hydrated structures, the introduction of a new fixation protocol involving lysine acetate, ruthenium red, and osmium (LRR fixation) results in a very well-preserved capsular structure in such a way that the amount of capsular material bound on the bacterial surface can be compared within different serotypes. In our method, capsular ultrastructure is preserved without the need for serotype-specific antibodies, which have been used in other studies to preserve the pneumococcal capsule. In addition, the new LRR fixation allows for studying the presence or absence of capsular material during adhesion and invasion of pneumococci on epithelial or endothelial host cells in cell culture experiments.